Some foods make me feel proud to be American, Ranch dressing is one of those foods. Creamy and rich, but also tangy and fresh, served as a dip or as a dressing, it is truly an American original. Here is my take on this country classic, lightened and brightened with yogurt and lemon. I know buying bottled is easier, but take my word for it, homemade is worth the work. 1. Preheat oven to 375-degrees F. Slice stem end off garlic head in one piece, do not discard. Place bottom and top on a large piece of foil, drizzle with olive oil. Wrap foil. Roast 30 minutes - 1 hours or until fragrant and very soft. Cool. Squeeze to remove 3-4 cloves from skin, reserve remaining roast garlic for another use, refrigerated or frozen in airtight container. 2. 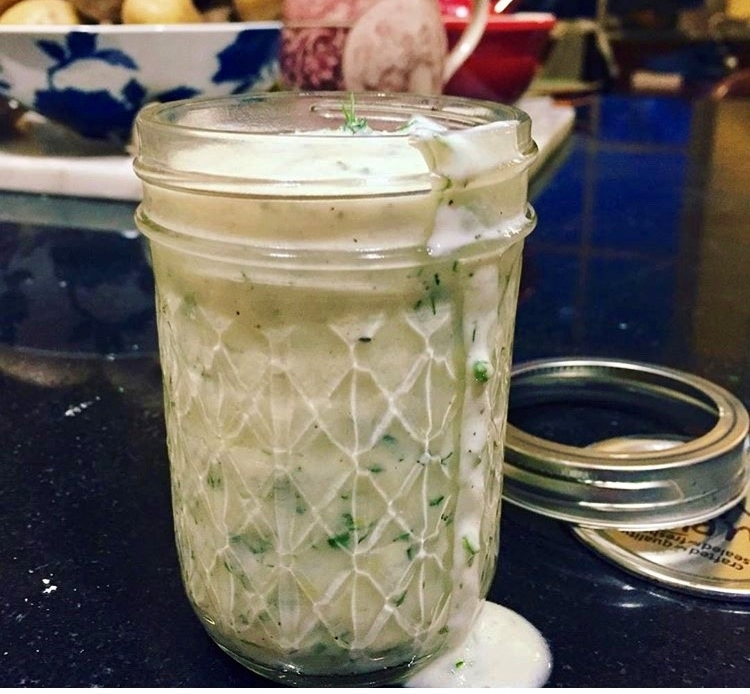 Mash roasted garlic into a paste and whisk to combine with remaining ingredients. Serve on salad or as dip for crudités or chips. What recipes or dishes make you proud of American food ways? Do you make your own salad dressings? Do you put Ranch on something unusual, like pizza?? Please, share in the comments!